The United States Congress designated the Marble Mountain Wilderness (map) in 1964 and it now has a total of 225,114 acres. All of this wilderness is located in California and is managed by the Forest Service. Craggy peaks, abundant meadows, large streams, and a whopping 89 lakes highlight this wild and pleasant area. Adding to the visual interest are many fascinating geological features, including Marble Mountain itself, a stark, red-and-gray marbled peak. Most of the lakes are gems set in rocky settings, and at least one-third of the Wilderness is cloaked in a great variety of trees, dominated by tanbark oak, madrone, and Douglas fir lower down, and whitebark pine, foxtail pine, and mountain hemlock higher up. You will find alpine meadows and bare rock in the highest elevations. Bear, deer, and many other species of wildlife are plentiful. Most of the peaks exceed 6,000 feet in height, with Boulder Peak being the highest at 8299 feet. Long recognized for its wild value, this region became a Primitive area in 1931, a Wilderness in 1953, and a part of the NWPS in 1964. Numerous trails provide excellent and extensive access to the Wilderness, and human use is rated as moderate. 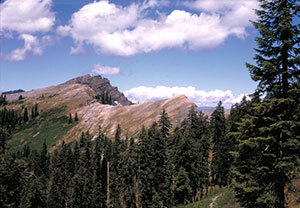 The Pacific Crest Trail crosses the entire Wilderness for 32 miles north-south, and accesses many other trails. Most of the trails offer relatively easy travel for humans and horses, and excellent campsites are to be had along the way. Planning to Visit the Marble Mountain Wilderness? How to follow the seven standard Leave No Trace principles differs in different parts of the country (desert vs. Rocky Mountains). Click on any of the principles listed below to learn more about how they apply in the Marble Mountain Wilderness.